A veteran, a father, a businessman, and a dialysis champion, Harold Sipe has seen many triumphs in his 87 years. The oldest of five kids, Harold began work at a young age to help financially support his family. But in 1951, he was drafted into the Korean War. After six months of intense training, he was deployed to Germany on a mission to learn more about Russian activity in the area. He said many men didn’t make it through the training, and once they got to Germany, things didn’t get easier. In Germany, his troop prepared for combat multiple times, but never had to battle. Harold said one thing he learned from his service was how to take care of himself. He explained that 60 percent of casualties happen during a first military excursion, and then it drops down to 25 percent by the second. “You learn rather quickly how to take care of yourself out there,” he said. He said he owes his success later in life to his military experience, because that’s where he gained self-confidence. Harold was one of five men who qualified to study at Cambridge based off his service entry exam results. 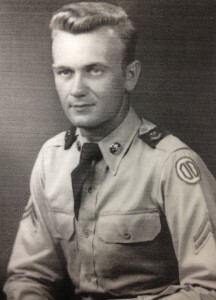 However, instead of attending college after his service, he began to work at a local plant to continue supporting his family. By the time he retired, every plant manager except for him had a four-year degree. It was about four years ago that Harold learned he had kidney disease. His family doctor noticed his creatinine levels were high, and a second test revealed he had stage four kidney disease. He began dialysis six months later at DCI South Shelby in North Carolina. One of the most amazing things about Harold is that he hasn’t let dialysis hold him back from achieving his goals and pursuing his hobbies. In his free time, the 87-year-old likes to handcraft bow and arrows. He’s made about a dozen bows altogether, and recently, he’s also started making homemade wild turkey calls. His goal is to lure a wild turkey with one of his homemade turkey calls, and then catch it with his own bow and arrow.